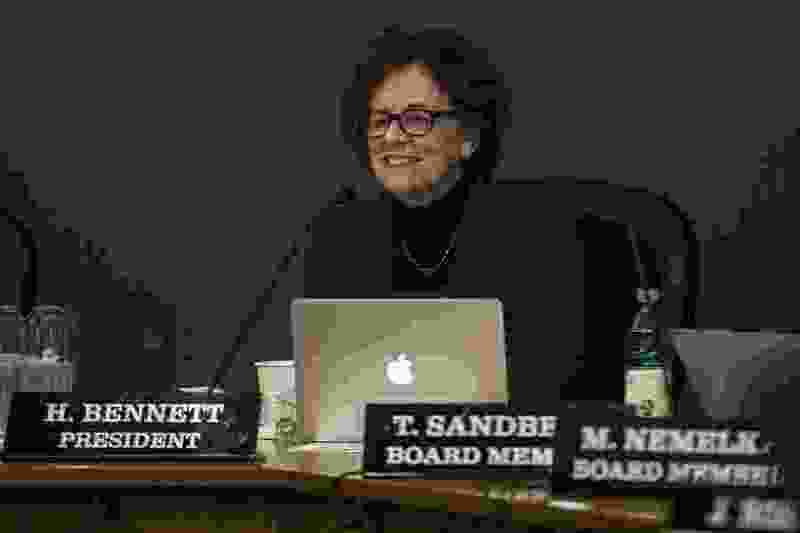 (Salt Lake Tribune file photo) Heather Bennett, member and former president of the Salt Lake City Board of Education (shown here at a board meeting in 2017), has died, a school district spokeswoman confirmed Tuesday, March 19, 2019. Heather Bennett, a member of the Salt Lake City Board of Education since 2005 and a passionate voice for children’s education, has died. Bennett died Monday night, “unexpectedly from a vascular issue, the origins of which have not been determined,” her husband, Kevin Hanson, said Tuesday. Bennett had been treated for pancreatic cancer for several months, the Salt Lake City School District confirmed in a statement. Salt Lake City Mayor Jackie Biskupski tweeted her condolences. “For 14 years, Heather dedicated her life to school policy, inspired to get involved as a parent of #SLC students,” Biskupski posted on Twitter. Bennett represented Precinct 5 in the Salt Lake City School District — an area that extends from the Jordan River to 1300 East, between 900 South and 2100 South, and includes East High School, Horizonte Instruction and Training Center, Innovations Early College High School and five elementary schools. Her current term was set to run through Dec. 31, 2020. From 2015 until the start of this year, Bennett served as the board’s president. Bennett argued against vouchers for private-school tuition, writing in a 2007 Salt Lake Tribune opinion essay that “vouchers let Utah legislators off the hook. They do nothing to address underfunding of public school programs.” She helped craft the district’s policy to prohibit discrimination against LGBTQ students in 2010, and supported including domestic partners on the insurance coverage for district employees. She championed later starts for the school day, citing studies that show students do better when they’re not up too early. As board president, she is credited with supporting early childhood education and early literacy programs, and extending the accelerated Extended Learning Program, or ELP, to more students. She oversaw the rebuilding of the former Lincoln Elementary, renamed Liberty Elementary, and the opening of the Liberty Community Learning Center. District officials note that while Bennett was board president, the board in 2017 passed the district’s Safe Schools Resolution, the first of its kind in Utah, designed to head off violence in public schools before it starts. Board member Kristi Swett, in a statement, said, “I couldn’t have asked for a better mentor and example of what it means to be a public servant. … I learned so much from Heather, her grace, and her ability to look past what was on the outside and really dig for what was on the inside." That collegiality wasn’t always easy to achieve. Bennett’s time as board president overlapped with the brief, contentious tenure of board member Michael Clara, who represented Salt Lake City’s west side. The conflict came to a head in 2015, when Clara complained he was being discriminated against because Bennett ordered a school resource officer to the front of the board’s meeting room — a response to an angry, profanity-laced phone call between Clara and then-superintendent McKell Withers. Clara countered by donning a sombrero and poncho, what he called a “Frito Bandito” costume, during a board meeting. Clara lost his re-election bid in 2016 to current board member Michael Nemelka. Bennett became a school activist as a parent of students at Lowell Elementary School in the Avenues. She represented Lowell parents when the district closed the school in 2001, a decision that some parents still haven’t forgotten or forgiven. When Bennett’s children started at Lowell in 1993, she became a volunteer and PTA member there, Kennedy said. When Bennett arrived, Lowell had two PTAs, one for the neighborhood kids and one for the ELP students. Survivors include her husband, Kevin Hanson, a professor in the Film and Media Arts Department at the University of Utah; three children: Samuel Bennett Hanson, Hannah Harper Hanson and Emma Rose Hanson; four brothers and a sister. Hanson said the family is planning a memorial service Saturday, with details to be announced. District officials said Bennett’s family is in the process of establishing a charitable fund that will support her priorities.